Sure, most cell phone carriers are more than happy to alert you to how much precious data you've been using up, but these little warnings usually don't come until you're dangerously near the monthly limit. 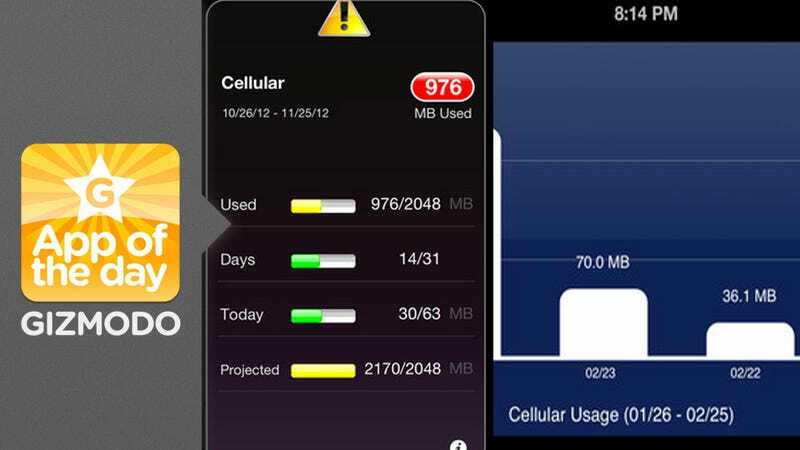 Megabytes keeps track of your data usage for you, and makes sure you're always aware of exactly where you stand. Keeps track of your data input and output. The app's icon even comes with its own little notification badge that will keep you constantly aware of how much data you've already used up or how much you've got left, depending on your settings preferences. A charted history displays your usage over a set period of time, so the longer you use the app, the more it gets to know you, projecting how much data it anticipates you'll be using in any given month. Whether we like to admit it or not, we're constantly on our phones, gobbling up data without a care. It's easy to go over your limit when you're not readily aware of how much is left, and we all know that panicked feeling when our carriers let us know that we're about to owe a hefty overage charge. With Megabytes, though, the badge icon means you'll always know exactly how much data you have left, even when you're not actively seeking out that specific app. And if that number is all you care about, you never even have to open the app; it'll just sit on your homescreen as a pleasant, watchful reminder to proceed with caution. Plus if you download today, you can have it all your own without paying a dime.